The smallest New Zealand daily newspaper is published 5000 miles away in a foreign country with a reporting staff of two - and several hundred readers who carry rifles and automatic weapons as part of their normal dress. And the sign outside the office that reads "please don't shoot the editor - he's doing his best," means exactly that. International news takes a poor second place to events of real interest - the activities of the 1st Battalion, Royal New Zealand Infantry Regiment, patrolling in search of communist terrorists along the Malaysia-Thailand border. The publisher and editor of the foolscap-sized news sheet is Sgt. J. W. Carter, of Auckland. The other half of the staff is cartoonist Sgt. P. Quinn, of Lower Hutt. The reporters are any members of the battalion who have a story to tell, preferably humorous. Sgt. Carter got the idea from the Australian Battalion which preceded the New Zealanders on border security duties. "On the first day we arrived," he said, "they published a report about us, so the next day we bought out an edition about them. It was so popular with the soldiers that we had to keep it going." The main aim is to record the humorous side of jungle life - even if many of the occurrences are funny only in retrospect - and to record events happening on patrol. But the news system is not overlooked. In fact, it is so efficient that one officer complimented the editor on his reporting service. Publication has its difficulties. The first edition was held up because the heat turned the printing ink into a non-flowing sticky mess and only by mixing it with a few ounces of brake fluid was the staff able to get the press moving. Specially sought are the copies that appear the day that a company comes out of the jungle for the normal two-day rest and recreation period. On these days, pointed comments appear, like the following: "The Assault Pioneer Platoon has us bluffed. They come back telling stories of elephant track, snakes, scorpions and a host of other terrifying creatures, and then, in the same breath, tell us that the bamboo was so thick they couldn't see three feet ahead. We thought only Superman had x-ray vision." Features include a serial number diminishing daily to denote the number of days to go until the end of the patrol, a daily cartoon on current events and a note on the temperature. This last may not be original, but it is certainly topical in the hot season, because the temperature recently has averaged 100deg with a top of 116deg. The battalion is at present fully deployed along the border, hunting for the last remaining terrorists - officials estimate that there are not more than 400 left - who were pushed back into this region. It is hard, gruelling work in rugged country that is, at the moment, so short of water that some of the Malayan villages have been abandoned because village wells have dried up. For most of the soldiers who arrived in Malaya last November, this is their first taste of jungle patrol work and the importance of the little daily news sheet back at base camp in keeping morale high is fully realised by the ranks. There is nothing quite like your own local newspaper. Photo: Sgt. 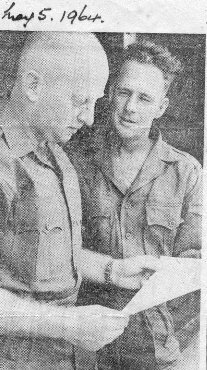 Quinn, cartoonist (left), and Sgt. Carter discuss a cartoon for an issue of the troop news sheet.